A Vertebral Subluxation causes interference in the communication between brain and body choking off vital life energy for a healthy body. A vertebral subluxation is a condition in which one or more vertebrae are forced out of normal position, reducing range of motion. The spinal cord and nerve roots in the spine may become stretched and suffer considerable soft tissue injury. The resulting instability of the spine and soft tissues can result in headache, dizziness, blurred vision, pain in the shoulders, arms and hands, reduced ability to turn and bend, and even low back problems. 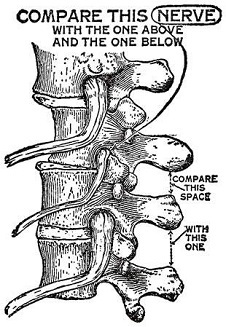 As the body attempts to adapt to the misplaced vertebra, symptoms may not appear for weeks or even months after the initial injury. The chiropractic approach to these types of injuries is to use specific chiropractic adjustments to restore normal spinal function. If the problems are caught early enough, inflammation can be reduced and scar tissue can often be minimized. Consult a Doctor of Chiropractic instead of enduring constant headaches, depending upon addictive pain medication or submitting to surgery!